Stan Tarshis was a Verdugo Hills High School gymnast whose Horizontal Bars specialty earned L.A. City runner-up honors in his senior year. He then went for college gymnastics to Michigan State University. 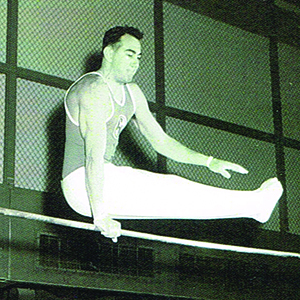 Stan won NCAA titles in 1959 and 1960 in Horizontal Bars. Only a silver medal in 1958 (when he lost to Abie Grossfeld) prevented him from being the only three-time winner in NCAA history. MSU tied for the NCAA title in 1958. He captured Big Ten championships in that event three times (1958-60). In 1960, he was chosen as the MSU Big Ten Conference Medal of Honor winner, which is awarded annually to a male and female athlete at each of the Big Ten institutions to the students demonstrating the greatest proficiency in both scholarship and athletics. Competing in Southern California major meet competitions in 1960, 1962 and 1964, Tarshis won the Horizontal Bar event at the Metro AAU, Senior AAU and prestigious Pasadena National Invitational.